As we edge closer to Xmas, it means that the weather is turning colder and therefore our skin drier. What is better than giving your skin some extra TLC whilst also cosying up in a nice, warm bath? I was recently contacted by Soapbombs offering the chance to try a Bath Blaster by Bomb Cosmetics that are available from their website. 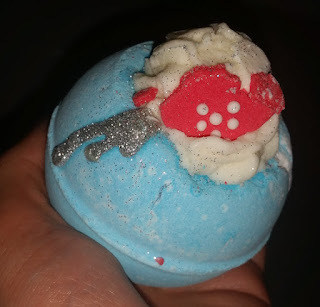 The choice of amazing looking bath bombs is pretty incredible, but I opted to try the beautiful and fun sounding Mad Hatter's Tea Party Bath Blaster, inspired by Alice in Wonderland. This particular Bath Blaster contains scents of cream and scones as well as orange and clary sage. Within the middle of the harder, blue bath bomb outer shell, there is a generous dollop of buttery goodness that is adorned with a little red teapot pouring out silver glitter. Aesthetically it's a very pretty bath bomb, as are all of the others that are available. Sadly, my Bath Blaster did arrive slightly broken, but only the teapot decoration. When it was delivered the delivery man did explain to me that something had happened en route as my parcel was also covered in something that had leaked, too. The bath bomb itself was packaged well within a lot of bubble wrap, so I can't place fault with either The Bomb Cosmetics or Soapbombs for the break. There is nothing worse than spending a long time applying your makeup for it to just wear off after a couple of hours. No one likes to waste their time. That's why today we're going to be looking at a spray that promises to keep your face in place for hours on end. Hurrah! 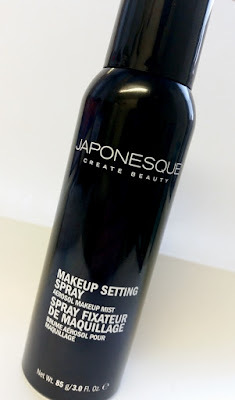 The Japonesque Makeup Setting Spray is described as a "pro performance fixative" that provides an airbrushed finish on the skin with a weightless application to keep your makeup in place all day. It is non-drying and invisible, claiming to leave the skin looking flawless. It comes packaged in a sleek, shiny black aerosol can with minimal white writing around it. It's pretty reminiscent of MAC packaging but with a different logo plastered across it. It looks professional and feels professional.